Cuttington’s SL Program is geared towards preparing students to acquire transferable skills that can be used in the development of the wider society and develop in students a lifelong commitment to service and leadership. Special focus is placed on the students/participants understanding the service and governance of their communities, where laws, traditions and social institutions take center stage. The pillars of the program are serving, learning, and effecting change, which in themselves have the potential to propel Liberia and Liberians to holistic sustainable growth and development. The SL Program addresses issues of health, education, and community development. Service-Learning students at Cuttington organize awareness and sensitization initiatives on waste control, prevention of communicable diseases such as tuberculosis, diarrhea, HIV/AIDS, etc, prevention of teenage pregnancy coupled with adolescent, sexual and reproductive health, among others. In addition, the program focuses on educating community dwellers, both young and old, on pertinent issues and information they need to be empowered. The education includes issues regarding civic responsibility, and tutoring in surrounding elementary, junior and senior high schools on major courses such as mathematics, English and the sciences. Finally, students initiate community projects such as pit latrines, shelters, wells, etc., as a way of developing the community and mobilizing them to take action. The mission of the Institute is to broaden students and participants knowledge and understanding of the major issues in the field of peace and conflict studies. It focuses on community reconciliation and peace building and moves toward national reconciliation and post conflict peace-building. It strives to strengthen the capacities of academic institutions, civil society groups, scholars, policy maker, legal experts and practitioners to prevent conflicts and establish sustainable peace in Liberia and the West African sub-region. 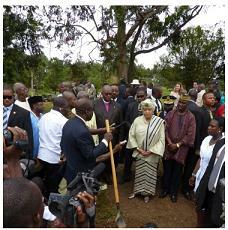 In the aftermath of violent conflict in Liberia, the president of Cuttington launched the Institute in 2004. In addition to research on peace and conflict resolution methodologies, Cuttington students go out into the communities and villages and conduct peace workshops.